Over the past couple of years, we've all watched colorful statement earrings dominate our weekly jewel roundups. Royal women today are leaving major necklaces and bracelets behind in their jewelry boxes in favor of bright, fun earrings. 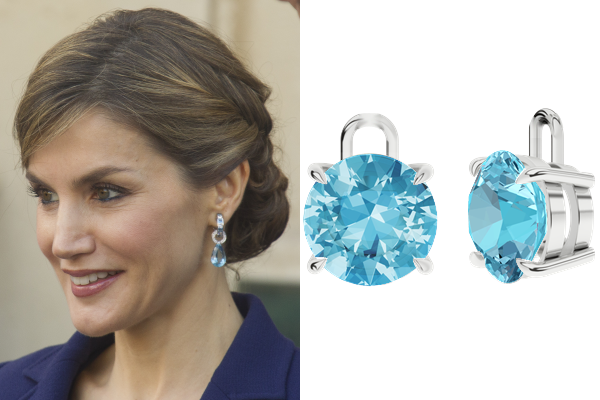 Today, we're looking at the way we can replicate some of our favorite royal earring looks with StyleRocks. 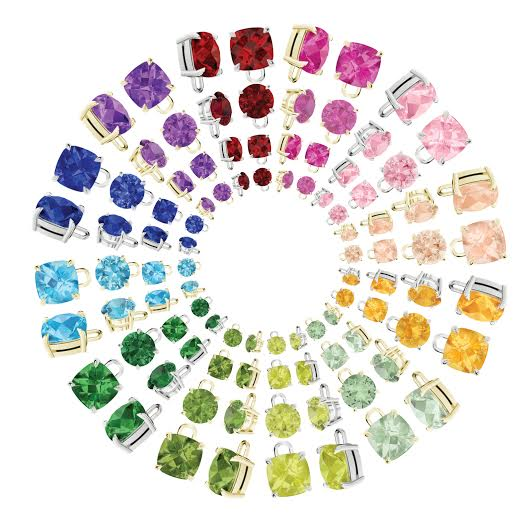 You'll remember reading about StyleRocks here last summer, when we partnered with the company to give away one of their lovely Russian Rings necklaces. Founded by in 2011 by Pascale Helyar-Moray, the company specializes in customizable jewelry, letting jewelry lovers play around with tons of different options to create an individualized look. I'm obsessed with their collection of detachable drops, a clever way to maximize an earring wardrobe without breaking the bank. 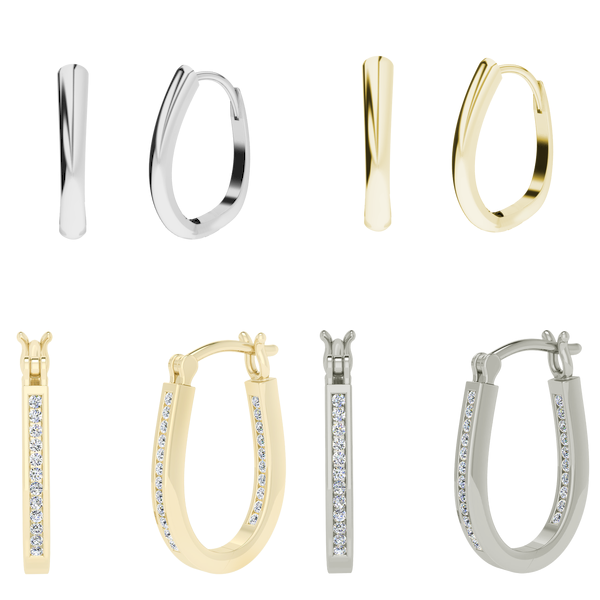 The StyleRocks collection of detachable drops can be worn on hoops purchased from the company -- you can see examples of four different styles above, including simple or diamond studded hoops in either yellow or white gold -- or they can be worn with hoop earrings that you already have in your jewelry box. The Duchess of Cambridge has embraced the idea of interchangeable gemstone earrings since the earliest days of her life as a Windsor. 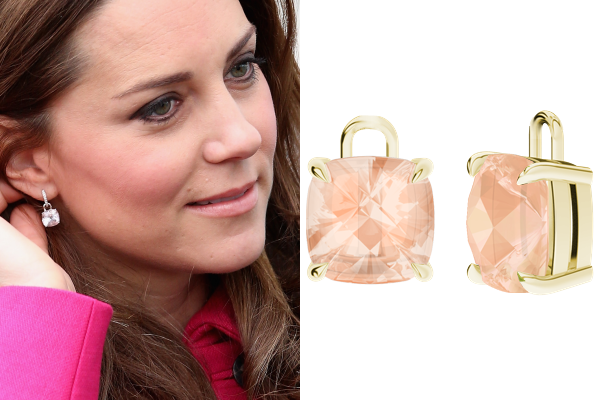 Above, she wears earrings with pale pink morganite drops. StyleRocks has a beautiful, nearly identical version: their cushion checkerboard cut morganite drops set in 9ct yellow gold. 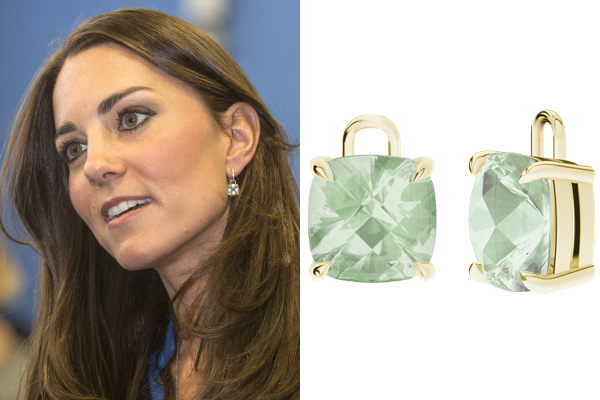 Kate also often swaps in a set of green amethyst drops -- the gorgeous pale green stones coordinate well with lots of different colors. You can mimic the look with the cushion checkerboard cut green amethyst drops, set in 9ct yellow gold, from StyleRocks. 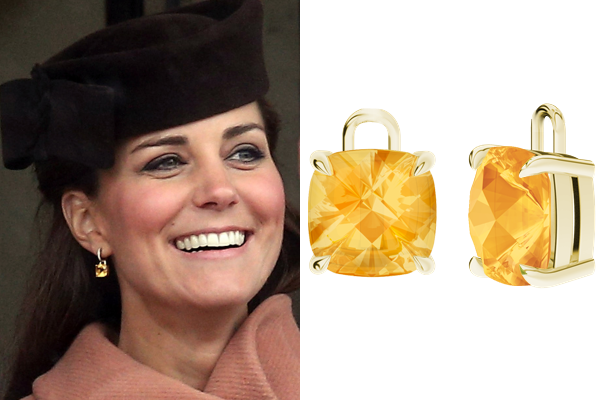 Kate also clearly understands the power of a good citrine earring to add warmth and brightness to any ensemble. StyleRocks offers a similar set of drops, the cushion checkerboard cut citrine drops set in 9ct yellow gold. 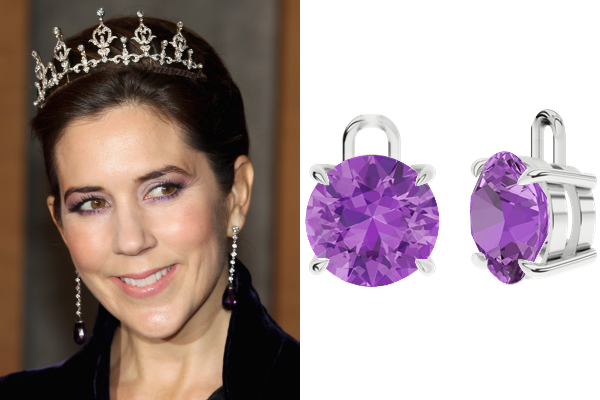 Crown Princess Mary of Denmark is a February baby, and she has embraced her birthstone with a gorgeous pair of amethyst briolette drop earrings. I really like the way that the StyleRocks round brilliant cut amethyst drops (set in sterling silver) capture the vibrant purple of Mary's pair. 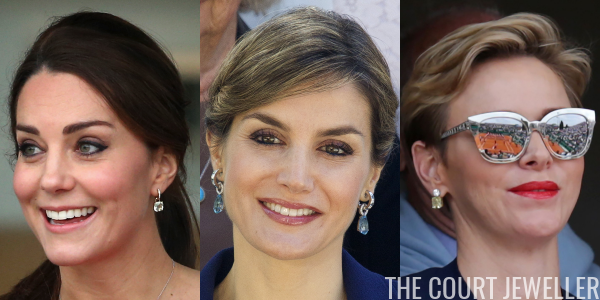 No royal woman wears earrings better these days than Queen Letizia of Spain. One of my favorite pairs from her collection are her chunky, modern blue topaz drop earrings. (Doesn't hurt that blue topaz is my own birthstone!) You get all of the punch, plus a bit of daintiness and versatility, from the StyleRocks round brilliant cut blue topaz drops, set in cool sterling silver. 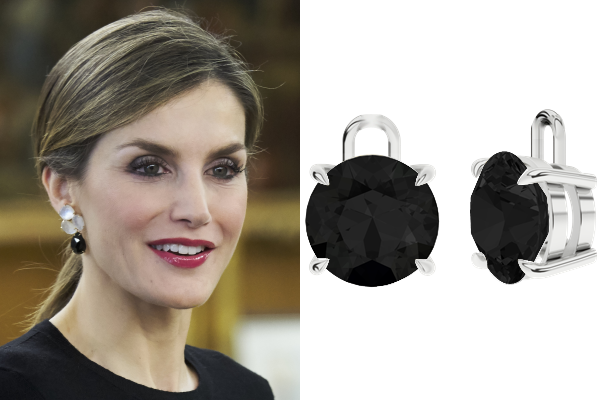 Letizia also recently debuted a pair of earrings with interchangeable stones, including this ultra-cool set of onyx drops. StyleRocks offers this gorgeous, classic pair of round brilliant cut onyx drops set in sterling silver -- so unexpected and so modern! 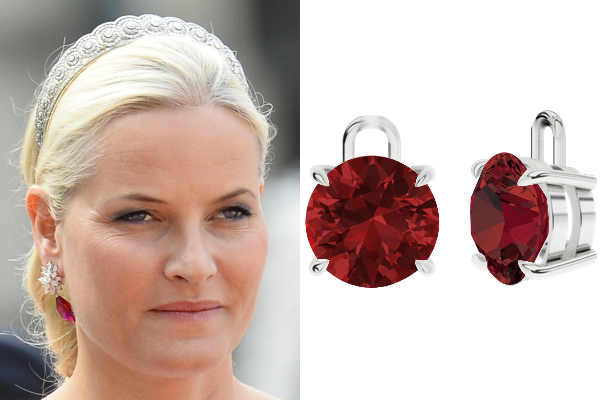 Crown Princess Mette-Marit of Norway has also jumped on the interchangeable-earring train; she wore this pair, with deep scarlet drops, at the most recent Swedish royal wedding. You can get a similar look with the StyleRocks round brilliant cut ruby drops set in sterling silver -- and because these rubies are lab created, they're extra vibrant and wallet-friendly. We may not all have access to the kind of glittering splendor that Princess Charlene of Monaco does, but we can all mimic the look of her stunning yellow diamonds with these StyleRocks cushion checkerboard cut lemon quartz drops in sterling silver. Really, is there anyone in the world, royal or not, who wears bright colors better than Queen Maxima of the Netherlands? I absolutely love her bright blue drop earrings, which are so similar in color to the StyleRocks round brilliant cut hydrothermal blue sapphire drops, set in sterling silver. 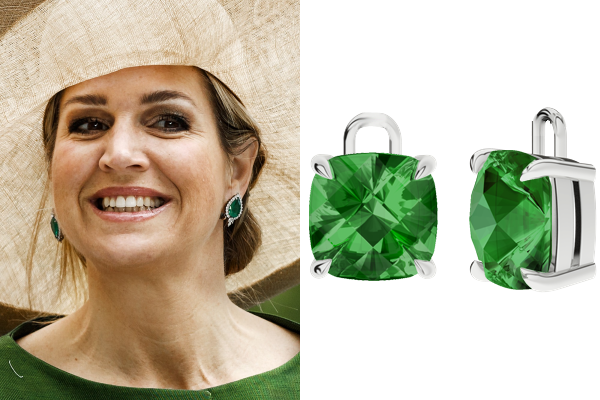 Maxima also has a stunning pair of emerald earrings that can be worn in various configurations. You can mimic their fresh green color with the StyleRocks cushion checkerboard cut hydrothermal emerald drops in sterling silver. 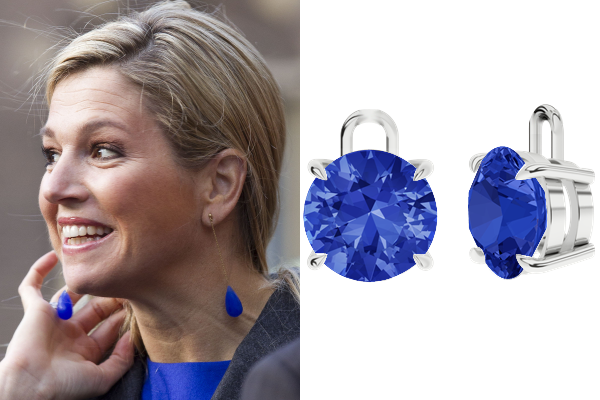 And finally, here's a really excellent affordable version of a pair of glittering royal drop earrings. 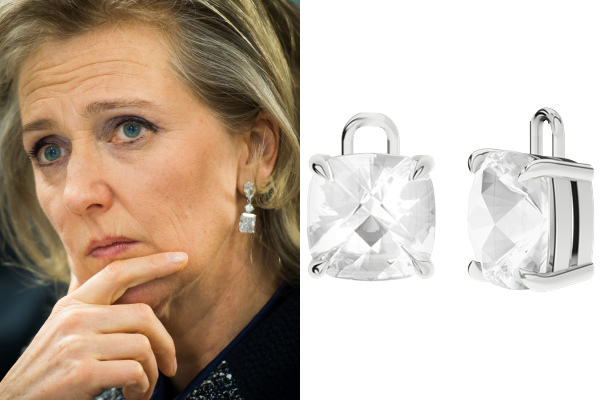 Princess Astrid of Belgium wears these beautiful drops, which are so like the cushion checkerboard cut white quartz drops (in sterling silver) from StyleRocks. Classic and gorgeous! 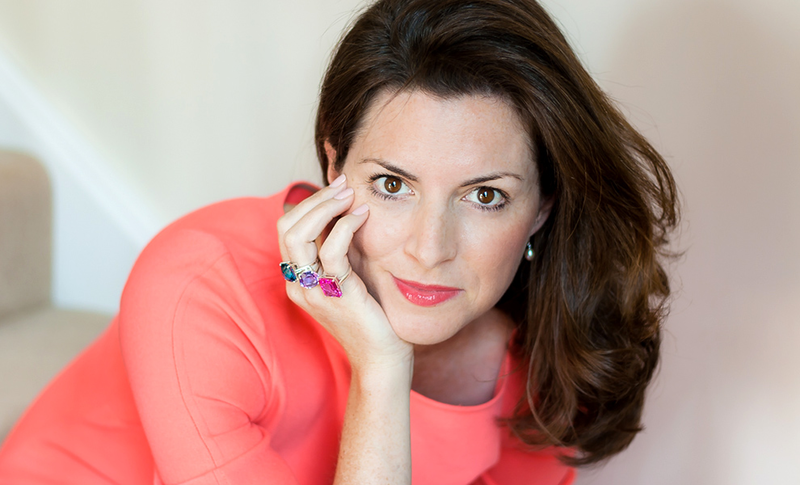 If you'd love to have piece of gorgeous jewelry from StyleRocks, you're in luck! StyleRocks has partnered with us to give one lucky winner a gift certificate worth $500 to spend on the site! 1. Leave a comment on this post telling us which of the StyleRocks detachable drop styles is your favorite. 2. Sign up for the StyleRocks mailing list. (Be sure to use the same e-mail address that you use for Disqus, so that we can confirm your entry. Also: if you signed up for the mailing list as a part of last year's giveaway, never fear: this is a new list, so you can still enter this giveaway, too!) Don't worry -- StyleRocks will never sell or share your e-mail address or details. And, bonus -- when you sign up, you'll automatically receive a $25 credit to spend on the StyleRocks website! -- The contest is open internationally. -- The value of the gift certificate is in Australian dollars (because StyleRocks is an Aussie company!). -- All orders from StyleRocks valued at $500 Australian dollars or more receive a valuation certificate for the customer's peace of mind, and all orders are shipped with DHL Express. -- The contest will close at midnight EST on August 8, 2016. -- We will contact the winner within 24 hours, and the winner must respond to our e-mail within 72 hours. We'll announce the winner here at The Court Jeweller as soon as we have confirmation. Good luck, and enjoy perusing the StyleRocks site!